In this day and age, technology plays an integral role in many aspects of our lives. While it seems agriculture would be exempt from that — for it’s just putting seeds in the ground and growing plants — this is far from the case. Farming is not simple. As the population grows at an exponential rate it creates really dynamic problems in terms of feeding people. More people means more food needs to be produced. But more people also means more homes will be built and more water will be consumed, taking away valuable land and water resources needed for food production. In order to feed this growing population with fewer resources, the agricultural industry has to rely on technological improvements. Advancements such as genetic engineering, GPS technology, herbicide tolerance, aerial imagery, robots, soil sensors, and precision agriculture have turned farming into a sophisticated business. Currently there are more than 55 million acres of cropland irrigated in the United States. Growers rely heavily on their irrigation systems to provide the right amount of water to their crops at the proper time. Drought stress on plants can easily and quickly reduce yields. Because of technology, soil moisture sensors can provide growers a detailed, comprehensive picture of their irrigation systems. Watching sensor readings allows them to turn on water when the moisture levels drop below a certain threshold, and then shut it off when field capacity is reached. In turn growers are only applying water when needed, reducing over application of water. This becomes both a financial and environmental win. They aren’t wasting water and money, nor are they leaching nutrients and chemical pesticides into groundwater. Using soil moisture sensors decreases input management costs while maximizing yields and profit. There are three main types of soil moisture sensors, each differing in how they take field measurements and determine soil moisture levels. Each type has their own set of pros and cons, filling specific needs in the market. Volumetric soil moisture sensors directly measure the amount of water in the soil. This category has the most sensor types: neutron moisture probes, heat dissipation sensors, and the common, di-electric sensors. The di-electric sensors measure the di-electric constant of the soil, an electrical property dependent on soil moisture content, and can be purchased in 3 variations: Time Domain Refractometry (TDR) sensors, Time Domain Transmissiometry (TDT) sensors, and capacitance or Frequency Domain Refractometry (FDR) sensors. Due to the technology used, volumetric sensors are the most expensive soil moisture sensors to purchase ($100+ per sensor, $400–1200 for an electronic reader). When installing them in fields they also require calibration to the individual soil type, making installation more cumbersome. On the flip side, they are incredibly accurate and provide instant data to growers. They are commonly used in research settings and in high-value crops where speed and accuracy justify the higher equipment cost. Soil particles hold water through either tension or adhesion. Tensiometers are soil moisture sensors that measure this tension between soil particles and water molecules. In order for plants to access this water they must overcome the tension to draw water molecules away from the soil particles and into their roots. The soil matric potential or soil moisture tension reading tells how hard the plant must work to extract water. 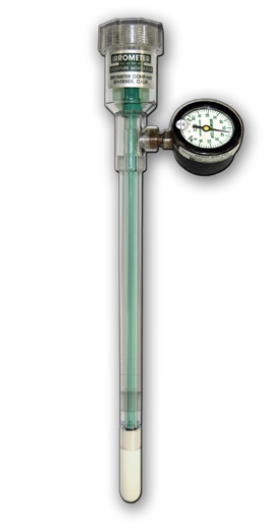 A tensiometer is a vertical, water-filled tube with a porous tip that is inserted into the soil at recommended depths; the soil draws water out of the porous tip of the sealed tube, creating a vacuum. Drier soils create a stronger vacuum since water molecules are harder to pull off soil particles. Overall, tensiometers are relatively simple and inexpensive equipment (sensors cost about $80–160 per unit1) to incorporate into your irrigation system; they are easy-to-use since the data collected is straightforward and doesn’t need to be interpreted. These sensors do however require higher maintenance throughout the growing season. The water in the sealed tubes needs to be refilled and cleaned, and they cannot stay in the field through the winter in colder climate zones. Tensiometers work best when installed in fields that maintain fairly adequate moisture content. They can only operate within certain levels of suction, rendering them useless in drier conditions. The most inexpensive option for measuring soil moisture content is solid state sensors which cost about $35–60 per sensor unit. Common types of solid state soil moisture sensors are gypsum blocks and granular matrix sensors. They work by using two electrodes to measure the electrical resistance in the soil. More water in the soil will reduce electrical resistance because the electrical current can pass through the water easier; less water will increase the resistance. After the electrical resistance is measured the water tension is calculated to determine the plant available soil moisture. In gypsum blocks the electrodes are embedded in a porous block of gypsum that has to maintain contact with soil. Granular matrix sensors have a granular matrix inside a metal case. The electrical sensors are embedded in the granular matrix above a gypsum wafer. Solid state sensors are the least expensive option for soil moisture sensors and do not require calibration for soil texture. However, they do need to be installed correctly and replaced periodically as the gypsum dissipates. They are much slower to measure field conditions, and are slightly less accurate in very sandy soils due to the larger soil particles. The biggest drawback to solid state sensors is that they do not work accurately in high salinity soils as readings are skewed by the elevated salt content. Because of their drawbacks, they do not work well in extremely arid conditions, or crops that are highly sensitive to water stress. Increasing populations continue to put a strain on the agriculture industry. As communities continue to grow, more food needs to be produced on less acreage and with less water available for crop production. In order to meet these demands, it’s become necessary to incorporate technological advances in farming. Irrigation is no exception. In the last decade, monitoring the soil moisture content of fields using remote sensors has become a critical management tool for many producers. It helps to irrigate exactly when fields need water, limits nutrients runoff from over-saturation, and reduces input costs through precision techniques. Soil moisture sensors vary in the technology used to measure soil moisture, as well as their advantages and cost. Find out more about soil moisture monitoring here!